Micropub in Ruislip, in the Good Beer Guide. 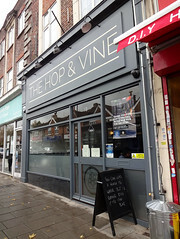 Like most micropubs, it's a conversion of a single shopfront in a parade of shops, but despite the small size, it doesn't feel cluttered or crowded at all. Wood-panelled walls are painted in white and dark grey, with framed drawings of fruit and flowers hung here and there. Swing top bottles of tap water sit on the tables, with small glasses alongside. Ales are served from casks in the cooled room behind the bar, and there's also a fridge of canned and bottled craft beers. Seating is provided by two long benches along the side walls, piled with colourful cushions, plus upright cushioned chairs and four tall stools at the bar. There's some sort of garden out the back, but we didn't take a look on our visit. Kake visited on a Friday afternoon in November 2018. There were three other customers when I arrived around 1pm, and three others arrived while I was there. No music was playing. Six real ales were listed on a blackboard on the wall: Burning Sky Plateau, Black Iris Endless Summer, Turning Point Disco King, Gun Red Ale, and a Harbour/Arbor collaborative American brown ale, all priced at £4.20-£4.30/pint. Service was friendly and welcoming, offering the option of conversation but not insisting. They don't do full meals, but they do cheeseboards and possibly other such things. Dog-friendliness: There were two dogs in on our visit, one belonging to a customer and the other to a member of staff. Accessibility: A small step to get in, no more than an inch. The ladies' doubles as an accessible toilet, with a large-size cubicle and grab bars, but no alarm cord. Last visited by Kake, November 2018. Opening hours taken from Facebook, October 2018. Last edited 2019-02-10 18:20:59 (version 4; diff). List all versions. Page last edited 2019-02-10 18:20:59 (version 4).